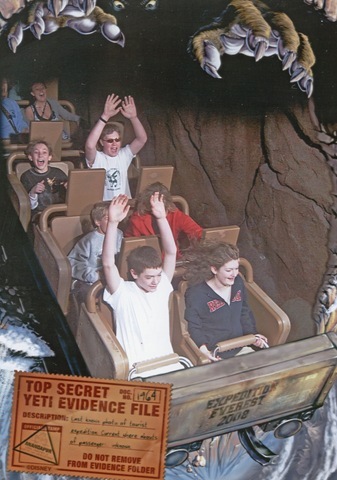 Okay so here we are on the ride at Disney's Animal Kingdom Expedition Everest. I think it was one of the kids favorite ride's during our trip to Disney in February. Chelsea wanted me to post it so she can copy and use it at school. The first picture is Chelsea and I are in front row: (notice us holding hands), second row: my sister and Lisa, third row: Lisa's son Jamey and my brother in law Tony. 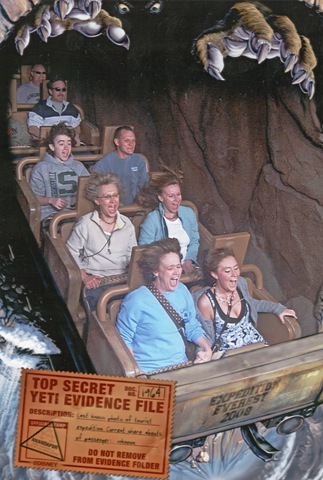 Then you see Terry in the first row in the car behind us who doesn't even look phased by this ride? The 2nd picture actually shows where we were on the ride - we were behind Zach and Cameron who are in the 3rd row of this car. I think these pictures speak volumes of just how much fun we had!